Freight and transportation is hugely important to the fashion and textile industry. Fabric & trim is shipped from suppliers to garment factories, from factories to wholesalers, from wholesalers to retailers, etc. 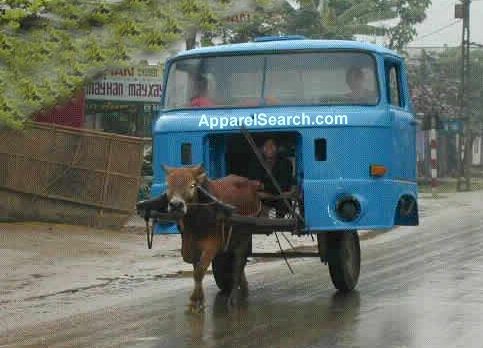 Looking for transportation for your apparel freight? This is the section to find freight companies and related information. This shipping department resource is intended to assist the fashion industry and textile industry manage their international or domestic freight shipping needs. Find a freight forwarder, find truckers, find logistics companies etc. Conway / Freight.com (NYSE: CNW):They are market and performance leaders in air freight (Emery Worldwide), less-than-truckload trucking (Con-Way Transportation), contract logistics (Menlo Logistics), and trailer manufacturing (Road Systems, Inc). Together they add up to a $4.2-billion, diversified company with a record of growth rarely seen in the transportation industry. Time-definite and day-definite freight transportation for commercial, industrial, retail, wholesale and manufacturing companies throughout North America. Markets and product lines are next and second-day regional and inter-regional, intrastate and interstate LTL delivery; truckload brokerage; airfreight forwarding; region asset based truckload service; transportation consulting, and assembly and distribution logistics programs for business-to-business supply cycle management. Provide e-commerce tools to customers for shipment processing, tracking, preparing bills of lading, generating reports and other tools on the Con-way website. Deliver-it: Deliver It specializes in overnight deliveries and scheduled services, freight, logistics and affordable order fulfillment. They service the Southern California Region at discounted rates than the larger, more commercial overnight companies. Their success results from their strong relationships they have built with their customers and team up with them for solutions to their transportation needs. They bring the basics back to the delivery service but add state of the art technology to order on-line and to track and trace your packages. Jones Act Information (from Ogletree Abbott Law Firm): The Jones Act was written to help injured seamen. The Jones Act also protects U.S. interests within its own waters and ensures that the United States maintains a fleet of merchant ships. Seamen injured on Ships, Offshore Oil Rigs, Barges, Tug Boats, Tankers, Riverboat Casinos Crew Boats, Shrimp Boats, Trawlers, Fishing Boats, Ferries, Water Taxis, and all other vessels on the ocean and all intra-coastal rivers and canals, as well as drivers, divers, and underwater personnel are typically covered. Federal Maritime Commission: (a) Statutory functions. The Commission regulates common carriers by water and other persons involved in the foreign commerce of the U.S. under provisions of the Shipping Act, 1984, as amended by the Ocean Shipping Reform Act of 1998 [46 U.S.C. app. 1701-1720]; section 19 of the Merchant Marine Act, 1920 [46 U.S.C. app. 876]; the Foreign Shipping Practices Act of 1988 [46 U.S.C. app. 1710a]; sections 2 and 3, Pub. L. 89-777, Financial Responsibility for Death or Injury to Passengers and for Non-Performance of Voyages [46 U.S.C. app. 817d and 817e]; and other applicable statutes. (b) Establishment and composition of the Commission. The Commission was established as an independent agency by Reorganization Plan No. 7 of 1961, effective August 12, 1961, and is composed of five Commissioners (``Commissioners'' or ``members''), appointed by the President, by and with the advice and consent of the Senate. Not more than three Commissioners may be appointed from the same political party. The President designates one of the Commissioners to be the Chairman of the Commission (``Chairman''). FreightGate: Freightgate is the industry leading, Internet based supply chain software solutions provider for global shippers, forwarders and carriers working to effectively manage the complex and demanding information flow in today's worldwide supply chain. Since 1994, Freightgate and its parent company have provided solutions that are low cost, easy to implement and deploy on a global basis. Using their ASP model, they host their partners' confidential supply chain data ontheir systems. The trust their customers have shown in Freightgate permits them to concentrate on their core business competency while Freightgate products give them control over their information on their terms. As the demand for information continues to drive competitive logistics, applied technological and industry-specific expertise have proven to be invaluable assets. Freightgate's focused experience provides their customers with industry-leading agility, reliability and innovation. Freightgate's PLTX modular suite of solutions allows you to leverage this innovation in a way that makes sense to your unique business, fulfilling your specific information needs and driving you ahead of the competition. Freight World: a professional guide to worldwide freight transportation and logistics. International Maritime Organization: Shipping is perhaps the most international of all the world's great industries and one of the most dangerous. It has always been recognized that the best way of improving safety at sea is by developing international regulations that are followed by all shipping nations and from the mid-19th century onwards a number of such treaties were adopted. Several countries proposed that a permanent international body should be established to promote maritime safety more effectively, but it was not until the establishment of the United Nations itself that these hopes were realized. In 1948 an international conference in Geneva adopted a convention formally establishing IMO (the original name was the Inter-Governmental Maritime Consultative Organization, or IMCO, but the name was changed in 1982 to IMO). The purposes of the Organization, as summarized by Article 1(a) of the Convention, are "to provide machinery for cooperation among Governments in the field of governmental regulation and practices relating to technical matters of all kinds affecting shipping engaged in international trade; to encourage and facilitate the general adoption of the highest practicable standards in matters concerning maritime safety, efficiency of navigation and prevention and control of marine pollution from ships". The Organization is also empowered to deal with administrative and legal matters related to these purposes. Iship (pricing shipments): The comprehensive iShip service makes it possible for everyone to price, ship, track and manage shipments over the Internet. Their mission is to give their customers Shipping Insight through Internet-based, multi-carrier shipping services that allow everyone to conveniently make the smartest shipping decisions. The comprehensive iShip service makes it possible for everyone to price, ship, track and manage shipments over the Internet. The iShip service lets shippers easily compare rates and services among multiple carriers, including DHL, Fedex, UPS, and the US Postal Service. iShip delivers precise and detailed shipping information - all in one easy-to-access, hosted service. Journal of Maritime Law and Commerce (JMLC) : a scholarly publication devoted to all aspects of admiralty and maritime law, including the law of the sea. If you're one of their many loyal readers, they think you'll find their site a handy reference guide. If you're not familiar with them, they invite you to spend some time at their web site. In addition to information about the Journal's history, policies, and activities, you'll also find profiles of the Editors and Editorial Board. And whether you're a first-time visitor or a regular guest, please be sure to contact us whenever you have questions or suggestions! The Journal of Maritime Law and Commerce was founded in 1969 by George Jay Joseph, a Washington, D.C. lawyer who perceived a need for a law review devoted exclusively to maritime law. The Journal, together with its sister publication, the Journal of Law and Education, is published by the Jefferson Law Book Company of Baltimore, Maryland. Journal of Commerce (Joc) : Through its publications, Web sites, and data services, Commonwealth Business Media is the leading supplier of business information for people involved in transporting goods and commodities in the United States and internationally. Maritime Administration (US Department of Transportation) - MARAD : The Maritime Administrator is the head of the Maritime Administration (MARAD) and advises and assists the Secretary of Transportation on commercial maritime matters, the U.S. maritime industry, and strategic sealift. The Maritime Administrator also maintains liaison with public and private organizations concerned with the U.S. maritime industry. The Administrator works for the Secretary of Transportation. The Administrator develops broad MARAD policies and manages MARAD's activities, particularly to ensure MARAD's compliance with statutory obligations and requirements. As the U.S. maritime policy advisor to the Secretary, the Administrator also maintains contact with international maritime groups, conducts negotiations, and maintains effective relations with other agencies of the Federal Government and the public. The Administrator is also the Chairperson of the Maritime Subsidy Board, Commandant of the United States Maritime Service, and Director of the National Shipping Authority. Neptune Orient Lines Ltd (NOL): is a global transportation and logistics company engaged in shipping and related businesses. Its container transportation arm, APL, provides customers around the world with container transportation services that combine high quality inter-modal operations with state-of-the-art information technology while APL Logistics provides end-to-end supply chain management services through its global network. Schednet : SchedNet is operated by the HKSG Group, the publisher of the HK Shipping Gazette for Hong Kong SAR and Mainland China, the Asian Shipper for Singapore, Malaysia and Indonesia. HKSG Group established in 1983, is a Hong Kong based company with offices in Hong Kong, Beijing, Shanghai, Guangzhou, Singapore, Malaysia and Indonesia. SchedNet is a vertical portal from HKSG Group, launched in early 1997 to provide the most up-to-date shipping schedules and shipping information to shippers and forwarders worldwide. SchedNet has the largest database of shipping schedule in the Asia Pacific region, information is updating everyday. Tradeport: TradePort is a repository of free information and resources for businesses that seek to conduct international trade to and from California. Created in 1996, TradePort is backed by an alliance of regional trade associations that assist California export and import businesses. Trans-Directory.com is one of the leading Business-2-Business Freight Forwarding, Transportation, Maritime and Logistics Directory on the web. TransPak-USA c/o W. Brown Associates: Manufacturer of self palletized shipping containers. Used through out the apparel industry for handling and storage of work in process or finished goods. Ideal for use in a controlled loop environment such as cut and sew manufacturing between separate operations. Address: 519 Delancey St. Philadelphia, Pennsylvania 19106 Phone: 215 922-2021 Fax: 215 922-2025 Email: Wbassoc519@aol.com Contact: Walker Brown - Pres. TransportLink Transportation Menu: The TransportLink is a free web resource designed for the many facets of motor carrier transportation. Sponsored by Atlanta-based SMC, the TransportLink Menu houses and links the home pages of motor carrier, third-party logistics and industry provider organizations in one convenient location. TRB (Transportation Research Board): is a division of the National Research Council, which serves as an independent adviser to the federal government and others on scientific and technical questions of national importance. The National Research Council is jointly administered by the National Academy of Sciences, the National Academy of Engineering, and the Institute of Medicine. The mission of the Transportation Research Board one of six major divisions of the National Research Council is to promote innovation and progress in transportation through research. In an objective and interdisciplinary setting, the Board facilitates the sharing of information on transportation practice and policy by researchers and practitioners; stimulates research and offers research management services that promote technical excellence; provides expert advice on transportation policy and programs; and disseminates research results broadly and encourages their implementation. U.S. Department of Transportation: the United States Department of Transportation. If you are an importer and your product has arrived, it is important to have proper documents and filings. It may be a good time for you to research customs clearance issues. If you have not found enough information in this section to properly ship your clothing or textiles, we suggest you try the search at Clothing B2B. From that business to business website you can search the internet for additional freight companies servicing the apparel industry.